Monthly Mini Quilt Series... Kitten's Halloween Party! It's the first Monday in October and that means it's free mini quilt pattern time - yay! This month I asked our friends at Stitches of Love Quilting to design a mini quilt for us, and aren't we lucky??? If you are here in time for our monthly giveaway, make sure you scroll to the bottom to enter. We've had some amazing designers contribute to this free mini quilt pattern series, so if you're just joining us now you can find all of our previous mini quilts in the menu bar at the top of the page and on my Mini Quilt Pinterest Board. Join in at any time and sew along with us - we'll even show off your mini quilt if you send us a picture during the month that the pattern was released here on the SewCanShe blog. 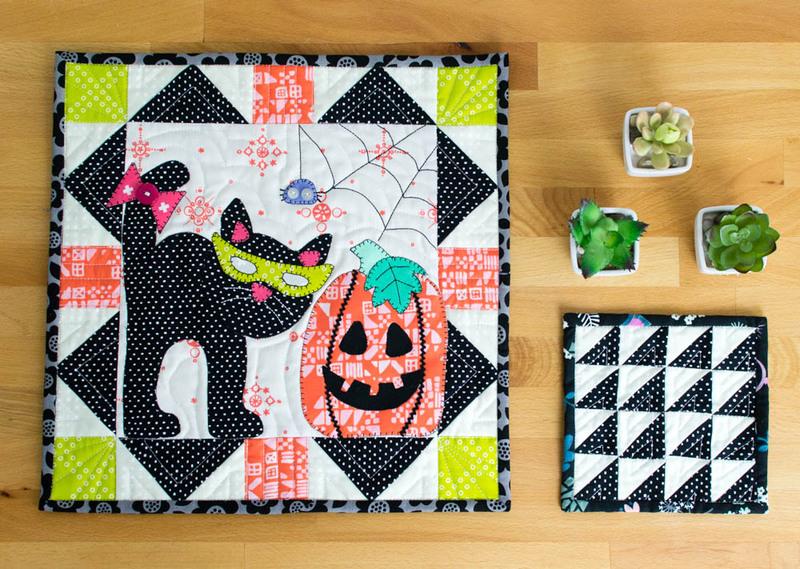 This adorable mini quilt is called 'Kitten's Halloween Party' and it's a combination of appliqué and traditional piecing. If you are new to appliqué (or you love pre-cut pieces), Stitches of Love is offering a two different kit options. One kit includes everything you need and the other kit has the laser cut appliqué pieces only. Don't worry, the pattern is free so you still have the choice of using all your own fabrics! Scroll down for the link to download it. When I was sewing my Halloween mini quilt, I had all these triangle scraps left over after making the 8 flying geese units. I don't know about you, but I have a REALLY hard time throwing away triangles! So really quick I chain pieced them into 16 black and white half square triangles. Then I pieced them into a mini-mini-quilt to go along with Kitten's Halloween Party! What do you think? Are you as scrap-crazy as I am to sew all those little triangles together to make half square triangles? If you are, how would you sew the half square triangles together? I'm not a mathematician, but I bet there are millions of different combinations. I can't wait to see all of your October mini quilts, and this month I'm also looking forward to seeing who takes the EXTRA challenge of sewing a mini-mini half square triangle quilt. Sewing the mini-mini is totally optional (except for quilt crazies like me who can't throw away triangles!). Download the free mini quilt pattern Kitten's Halloween Party from my Craftsy shop here. When you're done, make sure you email me a picture of your mini quilt so I can show it to everyone in an upcoming mini quilt inspiration post! Huge thanks to Stitches of Love Quilting for designing our mini quilt this month. Make sure you check out their adorable kits and patterns and the Mug Rug of the Month Club. Stitches of Love Quilting is also sponsoring a fun giveaway together with this month's free mini quilt pattern. Enter below to win this adorable Rudolph Trio Towel Kit!